This Red Tomato Chutney is a tasty combination of sweet sour and spicy tastes. It tastes like sweet Salsa with Indian spices. My elder son started calling this sweet Tomato Chutney as Salsa when he ate nachos and Salsa for the first time in restaurant. Now he asks me to make it at home whenever he wants to eat nachos. He also likes this fresh homemade red tomato chutney with chips and parathas. This Chutney goes very well with paratha, dosa / cheela, momos (dumplings), bread, pancake, chapati, chips nachos or with any meal. You can even apply it on sandwiches. I make this easy tomato Chutney very frequently at my home as my son likes to take it in his tiffin box with any vegetable paratha especially Aloo paratha. This reminds me childhood days when my mom used to give it in our tiffin box. I make this Chutney with both red and green Tomatoes. Somehow it’s difficult to get green Tomatoes round the year in Delhi, so most of the time I make it withRed Tomatoes. There is a slight difference in preparation of red and green Tomato Chutney. This recipe is made from roasted Tomatoes. 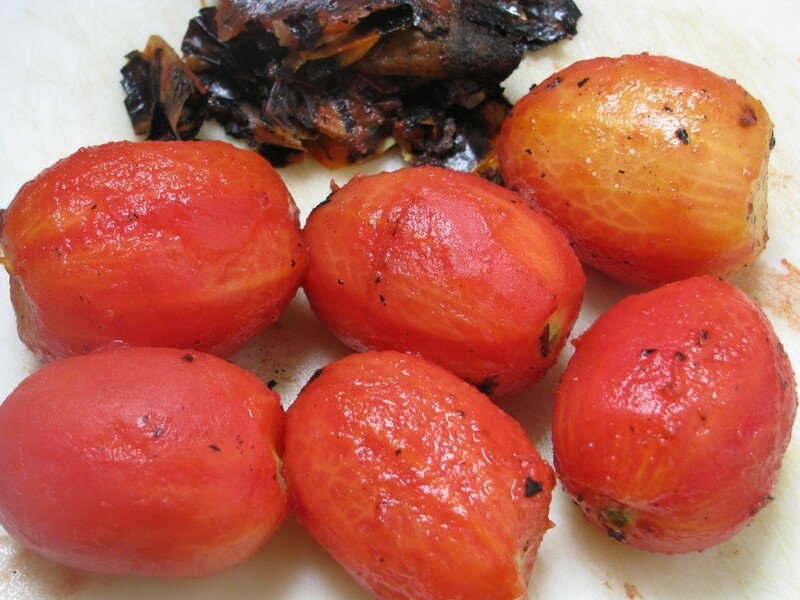 Tomatoes roasted directly on flames give nice flavor and color to this sweet and sour recipe. 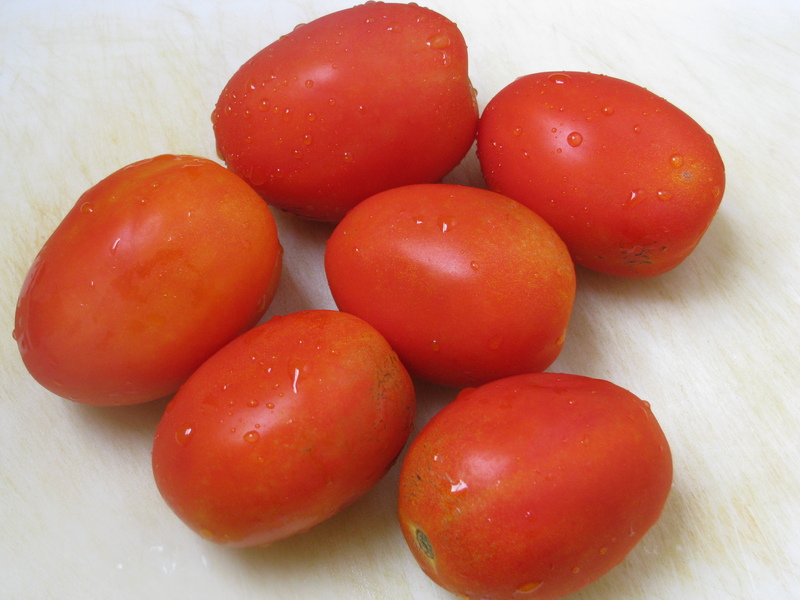 When you roast the Tomato, it’s easy to blanch them (remove its skin). Most of the time I use roasted Tomato for many sabjis and gravy. 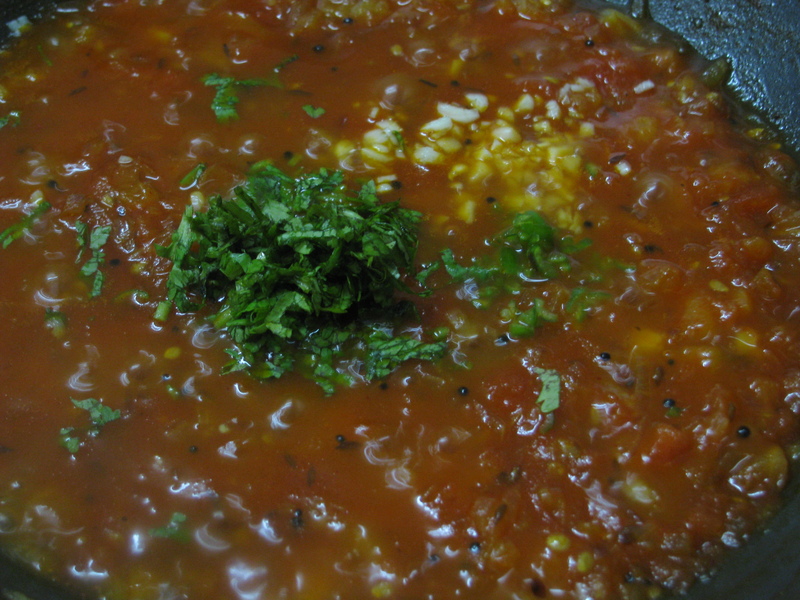 I add roasted Tomato in Pav Bhaji which gives it a rich red color. There are Variety of Tomatoes . To make this Tomato Chutney, choose Tomatoes with thick flesh. It gives nice texture to this recipe. Don’t use very sour Tomatoes (desi tamatar / gavthi tamate). 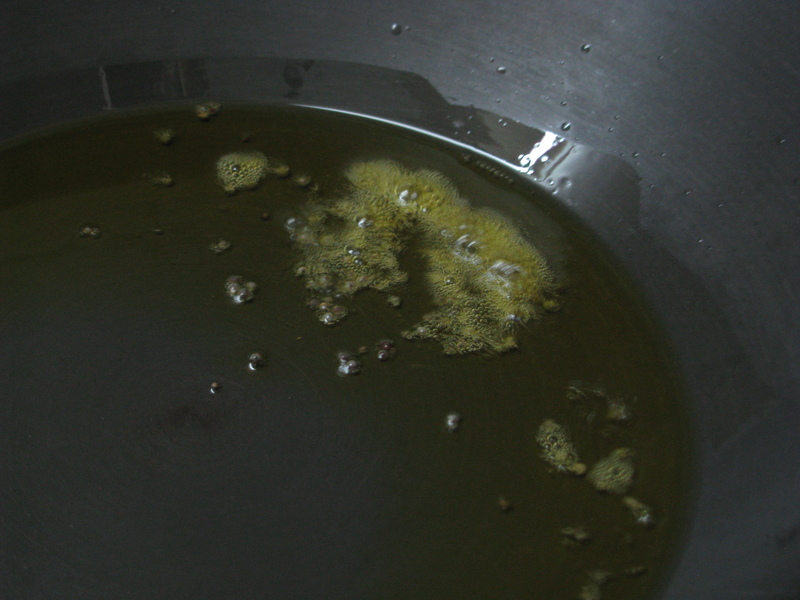 If you use very sour Tomatoes, you have to add lots of jaggery or sugar. You can add jaggery, Demerara sugar, white sugar or sugarfree natura to give sweetness to this Chutney. Sugar and jaggery give nice texture and color to this Tomato Chutney. 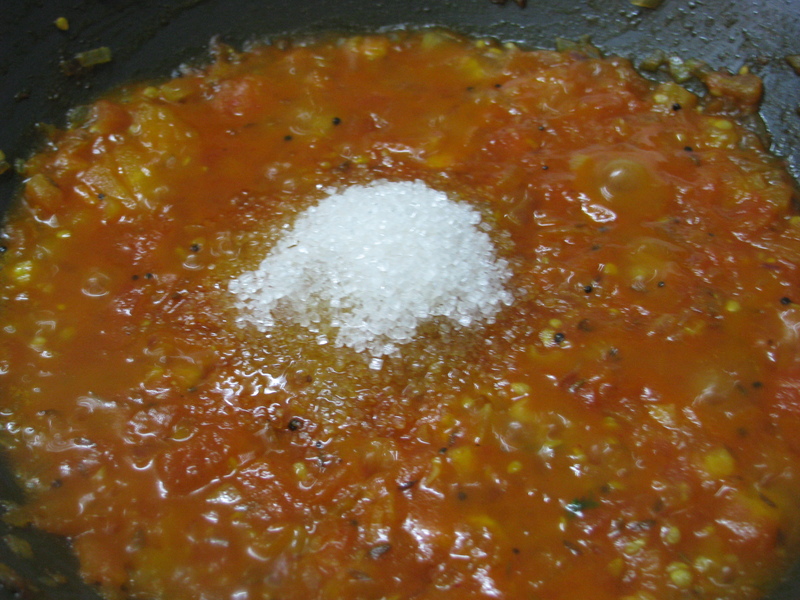 Quantity of sugar or jaggery you add in this recipe depends upon the sourness of Tomatoes. Some Tomatoes are very sour, because of that lot of sugar or jaggery is required to make this recipe. You can make this Chutney with or without onion. I don’t add garlic to make this Chutney. Without onion it’s a satvik Chutney. If you want to store this Red tomato chutney for more than 2-3 days don’t add onion to it. Store it in refrigerator. 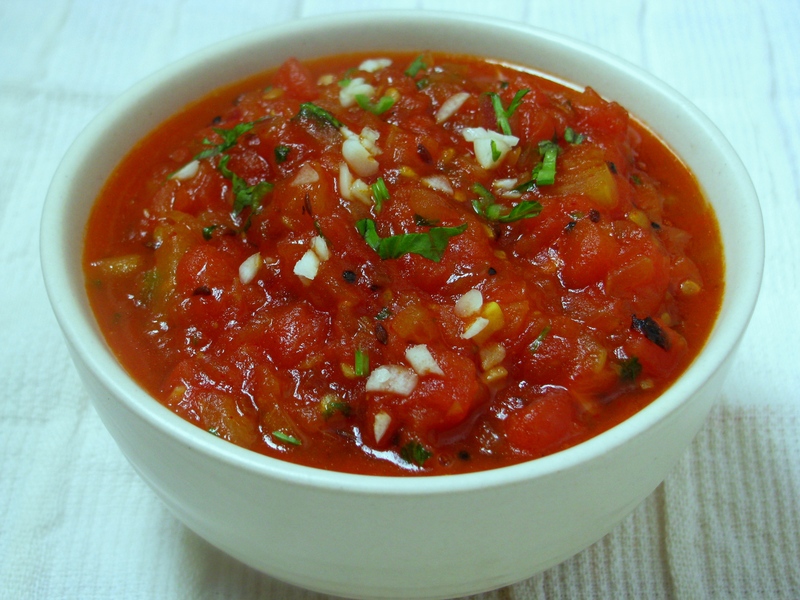 If you are using 1/2 kg Tomato to make this recipe, add 1 tablespoon vinegar to increase the shelf life of this Salsa. Vinegar also gives little sour taste to this Salsa. If you like Salsa a bit sour, add vinegar to it. Generally I make it fresh whenever I want. So I don’t add vinegar but I got this tip from my friend who stays abroad and does not have time to cook daily. I make this Tomato Chutney whenever I am travelling with my kids. I carry paratha or bread with this Chutney. You can cut calories in home-made tomato chutney by adding less oil while making this chutney. 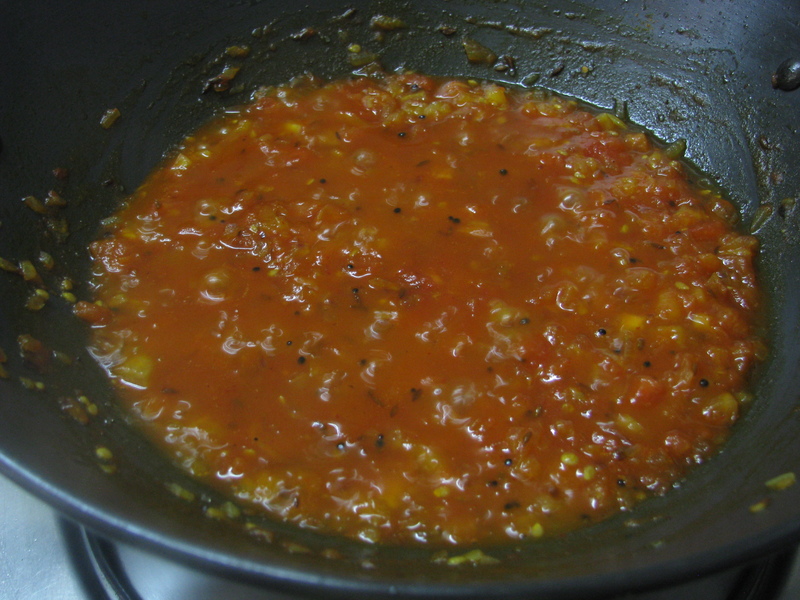 I have explained how to make this red Tomato Chutney / Salsa in a easy way, do share your comments and suggestions for this recipe . 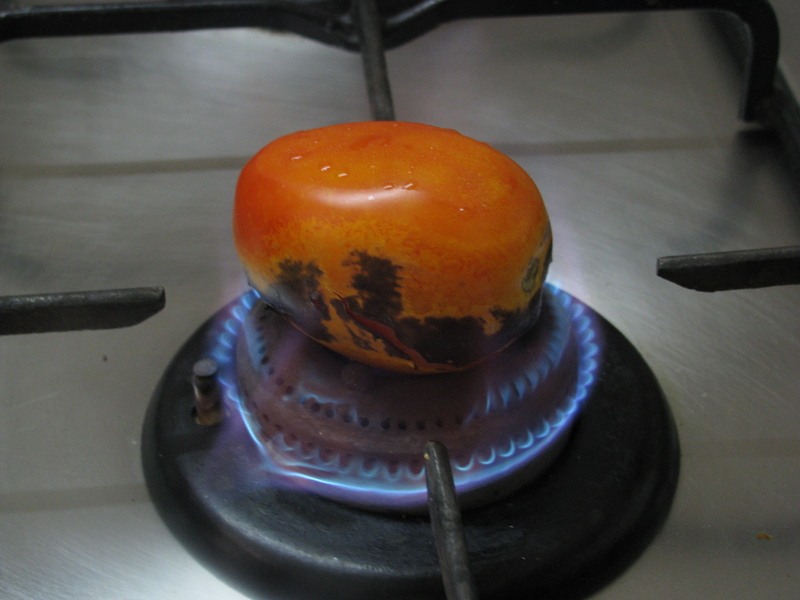 Roast Tomatoes directly on flames. When its skin become black remove it from flames and let it cool down. 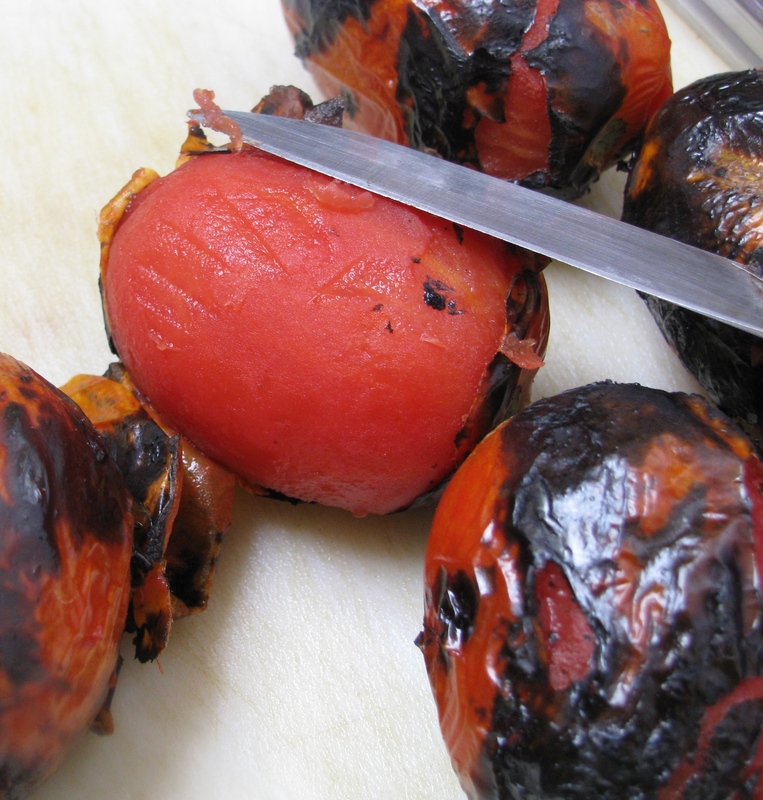 Remove the charred black skin of Tomatoes with knife. 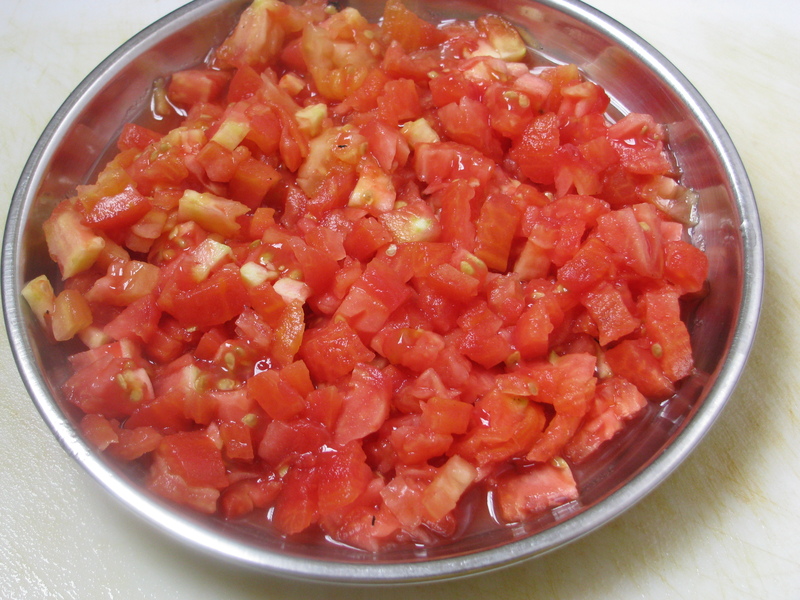 Chop Tomatoes into small pieces. 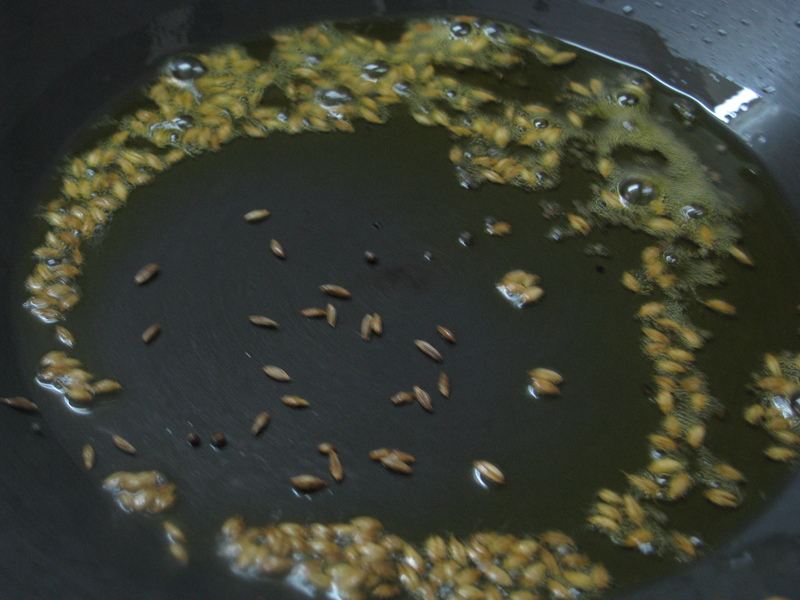 If you want, you can remove the Tomato seeds (deseed tomatoes) before chopping. When it starts crackling, add cumin seeds. 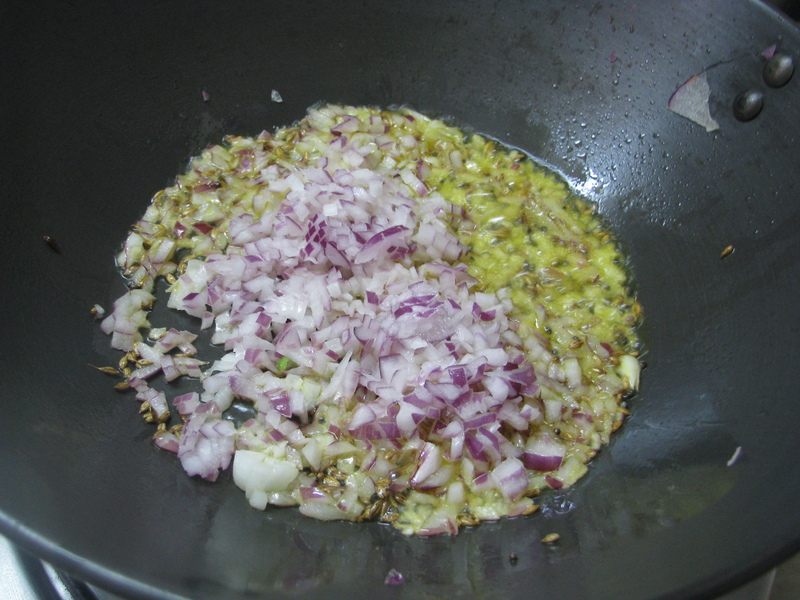 Add onion and stir it until it becomes soft. This step is optional. You can avoid onion if you want to store this Chutney for 2-3 days in refrigerator. Add red chili powder and turmeric powder to it. Mix it nicely and add chopped Tomatoes and salt to it. Mix it and cook it covered for 5-6 minutes on low flames or until Tomatoes become soft. Stir it occasionally. When Tomatoes become soft, add sugar. Mix it and let it cook for 3-4 minutes. Add finely chopped coriander leaves, garlic and green chili to it. Mix it and remove it from flame. 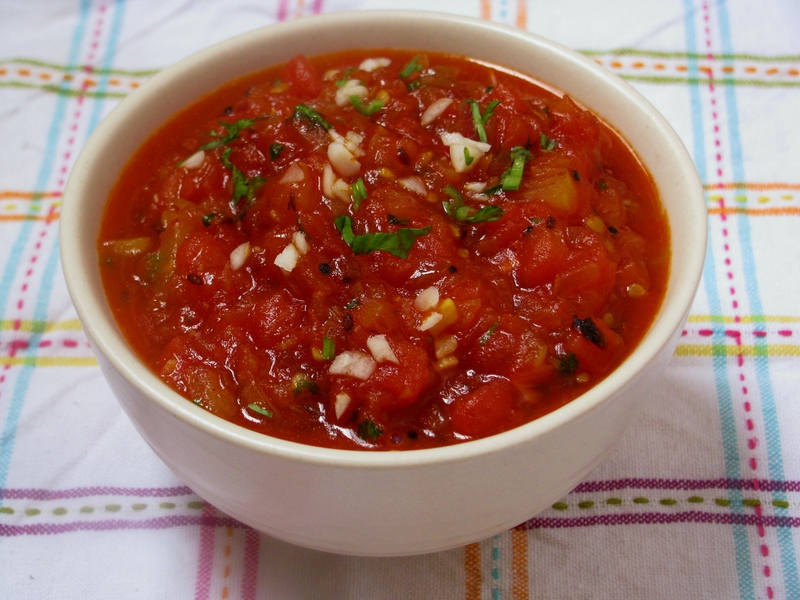 Serve this Tomato Chutney / Salsa with paratha, chips, nachos, idli, dosa, momos or with any meal.